Emergency vehicles are seen near the Manhattan Beach Pier on Friday, July 22, 2016. 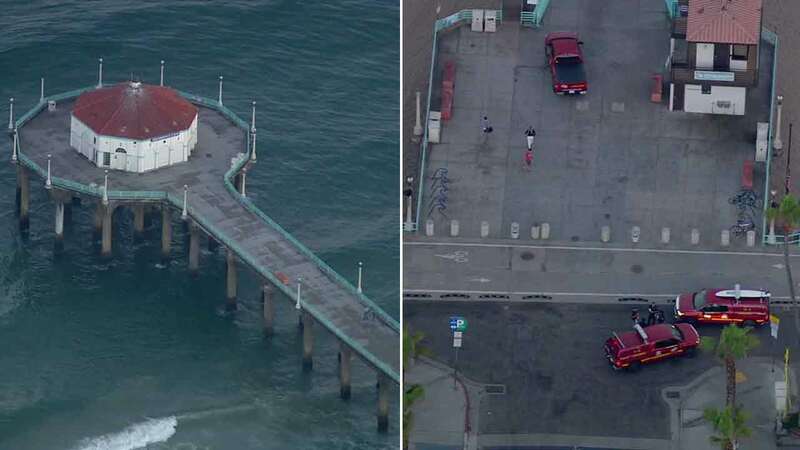 MANHATTAH BEACH, Calif. (KABC) -- A swimmer who went missing after jumping off the Manhattan Beach Pier was found safe Friday morning. Los Angeles County firefighters and lifeguards responded around 2:30 a.m. following a report about a missing swimmer. The Coast Guard also aided with the search. Searchers said two people jumped into the water, but only one made it to shore. The second swimmer was eventually found at a nearby Ralphs grocery store, Los Angeles County fire officials said. He was not injured. #PierIC the missing adult male has been located on land with no injuries. #MBPD has taken him into custody. According to authorities, both swimmers were intoxicated. It is illegal to jump off the pier. The identities of those involved were not immediately released. They were described as being in their 20s.